This one differs from “Ancestral Technologies” (wh017) in a couple of ways. The theme explores the experience of a pilgrimage in some unnamed Eastern land. A solitary (western?) traveller mingles with the hustle and bustle of the pilgrimage route, but is ultimately alone and destined to come face-to-face with none other than himself. In this project, Saluki Regicide contributed loops and samples to Mystified, who mixed them with his own and composed the tracks. 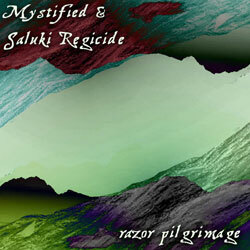 The concept of the project comes from Mystified, and Saluki Regicide provided the cover art. Thomas Park, of Mystified, brings into his work equal doses of illbient, minimal, industrial, ambient, experimental, and a handful of other esoteric styles, and to good effect. C.P. McDill of Saluki Regicide seeks to bend time and space, or at least soundwaves, to do his bidding. This entry was posted in C.P. McDill, Catalog and tagged C.P. McDill, Catalog, Mystified, Releases, Saluki Regicide by C.P. McDill. Bookmark the permalink.